Niagara Falls has long been on the list of the best areas in the world to take photos. From the mighty falls themselves to all of the other lovely places in our city, a shutterbug won’t be disappointed with the wide array of amazing places that just beg to be captured on film, or memory card. Whether you’re a professional photographer with an arsenal of equipment, or you just simply love to have great photos of your family’s adventures, you’ll find a wealth of incredible places to preserve for your scrapbook or portfolio. Beautiful gardens, local parks, and hiking trails are all wonderful places for an impromptu photo shoot. 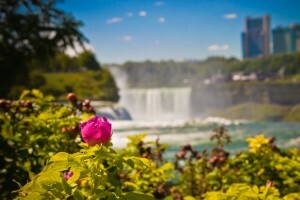 While you’re sure to have your camera at the ready to capture every moment of your visit, consider some of these places in Niagara that will make that photo journal even that much more spectacular and memorable. One of the loveliest parks in Niagara, Queen Victoria Park is the perfect place to capture the beauty that abounds in our area. The park is open year around, which allows visitors to experience the park and its beauty in all seasons. Spring is one of the best times to photograph the park, as it comes alive with hundreds of thousands of daffodils in full bloom. Summer sees the thriving rose gardens and the myriad plants that make up the park’s famous carpet bedding. The bright colors of the changing leaves in autumn make for stunning photos, especially when they’re taken in the golden light of early morning. Winter photos can be spectacular here, especially when combined with the freezing mist of the falls as a backdrop. If you enjoy photographing the world in all of its natural beauty then a trip to the Niagara Gorge Discovery Center will be perfect. With miles of hiking trails that suit all abilities and offer varying spectacular vistas, this is the place to get close to the nature that abounds in our neck of the woods. From the easy stroll that is the Great Gorge Scenic Overlook hike to the more challenging Whirlpool Rapids Adventure hike you will be snapping your shutter over and over. At their best in the summer months these trails offer incredible views and some potential encounters with local wildlife. Some guided hikes are available for a small fee, and some of the more difficult trails do enforce age requirements. Of course when any photo enthusiast visits Niagara they want to take stunning pictures of the falls themselves. One of the best places to get as close as possible to the iconic falls is at Horseshoe Falls, which offers guests the chance to get behind the falls. This experience is bound to result in stunning photos of the cascades of water tumbling down. Goat Island is a wonderful vantage point from which to capture incredible images of both the American and Bridal Veil waterfalls. The island is also home to the Cave of the Winds and other natural sites that have inspired wonderful photos throughout the years. The Niagara area is filled with incredible sights and experiences that you’ll want to remember for years to come. Keep your camera batteries charged and be ready to click away as you enjoy some of the most beautiful places that the region has to offer.